Rendezvous Senior Day Service, Inc. provides social engagement and support to older adults and people with disabilities. 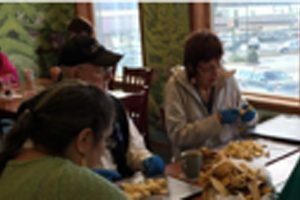 The group, which recently was awarded an AFA Family Respite Care grant, and purchased the AFA Partners in Care training DVD, recently added a unique activity to its roster. Each week, two local grocery stores donate produce and other food items to Rendezvous. Looking for a way to use-and not waste-any of these donated items, executive director Licha Kelly-King hatched an idea. Together with her team, she began making homemade jellies, apple butter and applesauce, trail mix, and more with the program attendees. The group has its own recipes, makes its own labels and sells its “Old Hands New Ideas”-branded products at local craft and art fairs to raise money for its programs and services. And the products are a hit! At its first craft fair, Rendezvous made enough money to purchase two commercial-grade dehydrators. Rendezvous has even become a tour destination for visiting cruise ships. Click here for more information.